Come By Land or By Sea and relax with friends in a casual, intimate atmosphere. The comfortable seating in front of a big screen TV will make you feel like you're sitting in your own den. Or, the outside deck & bar may be more to your liking. Browse our large, walk-in humidor and then enjoy your favorite cigar in comfort. 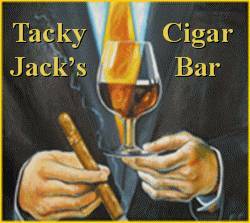 Tacky Jack's Cigar Bar is now available for Private Parties Call 251-981-4144.